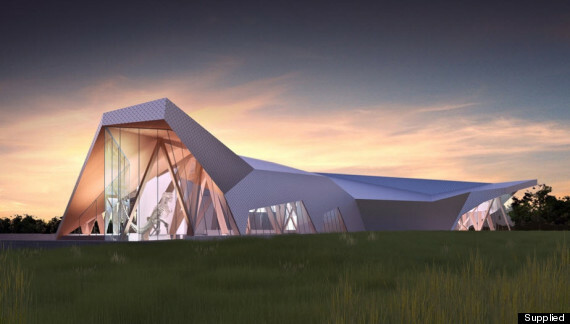 Alberta's newest dinosaur museum's unique design is attracting attention in international architecture circles. Azure magazine has selected the Philip J. Currie Dinosaur Museum as one of their Top 10 Projects to Follow in 2014. The museum, currently under construction in the town of Wembley and slated to open later this year, joins Azure's list alongside projects in the Netherlands, Milan and China. The 41,000-square-foot museum will feature a large dinosaur gallery of skeletons from the region, a theatre, and oil and gas wing and two classrooms where visitors can watch palaeontologists work. The building was designed by Toronto-based Teeple Architects – the same firm that designed the Montrose Cultural Centre in Grande Prairie. “The building tells the story of the bone-bed, the scientists and researchers, and of the Pachyrhinosaurus lakustai (a dinosaur first found in Wembley and identified as a new species in 2008),” said Martin Baron of Teeple Architects, in a news release. Brian Brake, executive director of Pipestone Creek Dinosaur Initiative, the organization behind the museum, told the Edmonton Journal the project is set apart from others on Azure's list because it's being built in a community of 1,400 people, as opposed to an urban area. “We’re remotely located here, so any edge we can get that will cause people to make that 450-kilometre trek from Edmonton is a good thing,” Brake said. Joining the dinosaur museum on the Toronto-based periodical's list are several other Canadian projects: Vancouver's Beach + Howe Tower, Mirvish+Gehry Toronto Towers, the Ryerson University Student Learning Centre and the Halifax Central Library project. According to the Daily Herald Tribute, the grand opening of the museum is set to take place Aug. 7-9, 2014. Performances by the Canadian Tenors and Grande Prairie Boys Choir have been confirmed.